KOBELCO Construction Machinery USA introduced a new model, the SK55SRx, to the North and South American markets during ConExpo- Con/Agg. 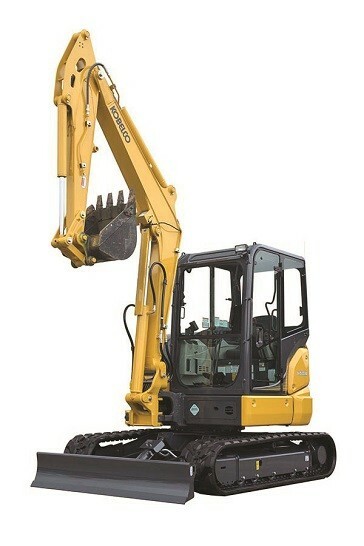 The SK55SRx is a mini-excavator that delivers full size performance and short radius agility from its compact footprint. This new machine comes in both cab and canopy models. The 11,050 lb. SK55 is engineered to supply maximum digging power while maintaining a short tail swing. Its 37.4 hp, water-cooled Yanmar diesel engine is not only powerful, but also fuel efficient, delivering operational cost savings through its multiple modes, including an “Energy Conservation Mode”, which can easily be engaged with the push of a button when the work at hand allows the operator to run the equipment at lower power and performance levels, providing greater job efficiencies. In addition to fuel economy and power, the SK55 has many practical performance features including an arm force of 5,530 lbs and a two-pin bucket force of up to 11,128 pounds for robust digging. The machine’s dig depth of 12 feet 10 inches, 20 feet 6 inches reach at ground level and a swing speed of 8.5 rpm ensure productivity goals are always within reach. The machine attributes of the SK55 work together to make it a workhorse that’s ready-for-use on a wide-range of jobsites.